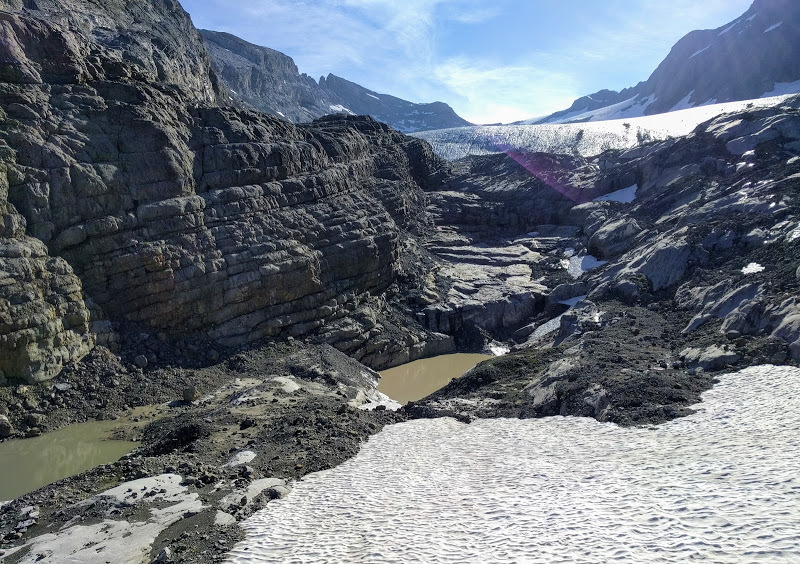 After living in Zürich for four years, I’ve finally — finally — gotten around to going and seeing the glacier which I can see every day on the southern horizon (when it’s not cloudy). 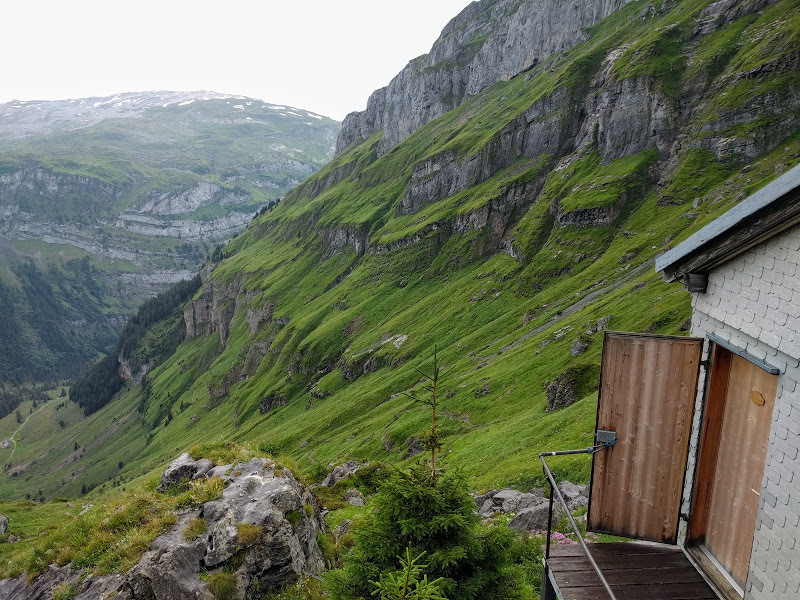 This was an overnight trip, staying at the Glärnischhütte mountain hut; huts are big business in Switzerland, and I shared the dormitory with about a hundred other people, many of whom snored like drains. The copious amount of beer probably hadn’t helped. 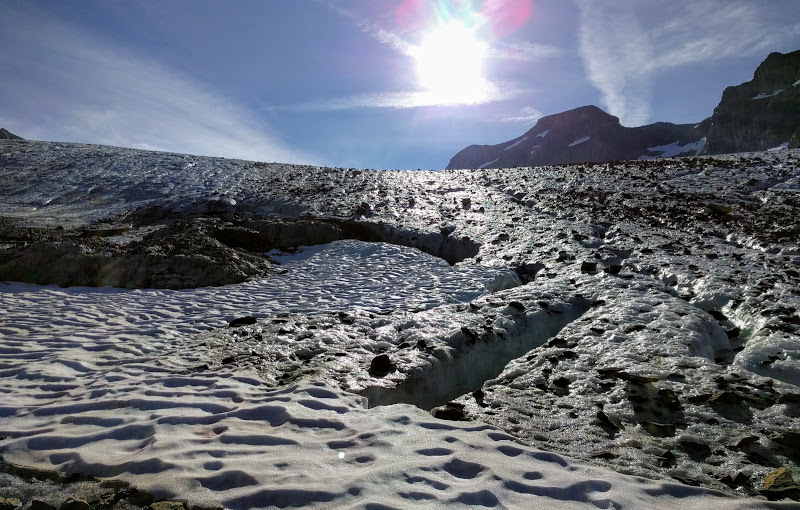 I climbed the 1100m from the Vorauen bus stop to the hut on Saturday, then got up early (06:45; everyone else had left, and there was just me and two other walkers left for breakfast) for the remaining 400m to the glacier. 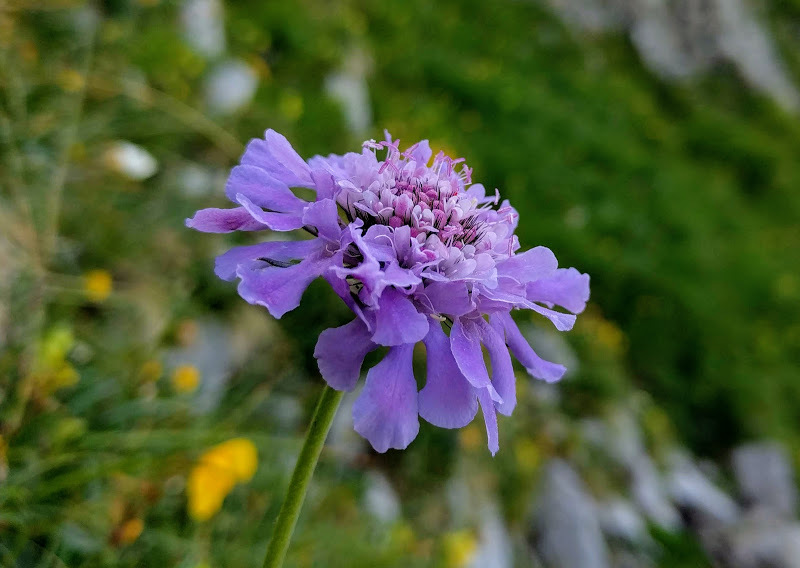 That was straightforward, so on the way down again I took the long route back, traversing round the head of the valley before climbing over Silberenalp and descending to Richisau. A map, with the annotated Sunday route on it. 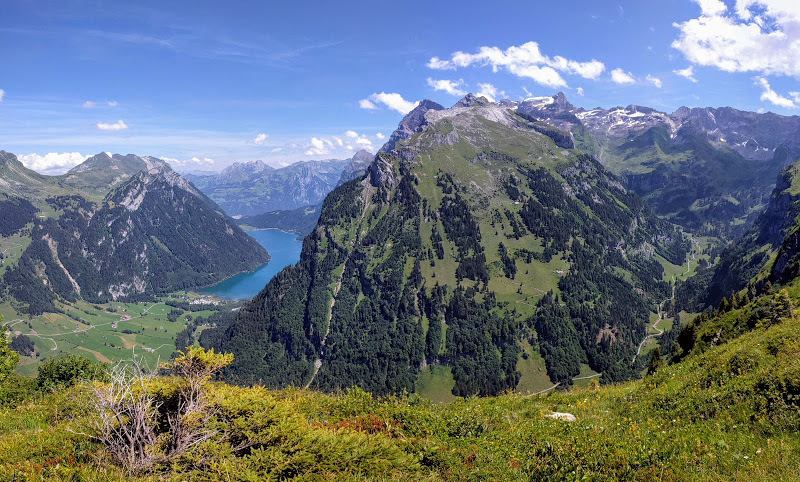 as well as lots of valley walking along Klöntalarsee itself; it’s a good place to take visitors. The view from Glärnischhütte (the previous night, in the rain). 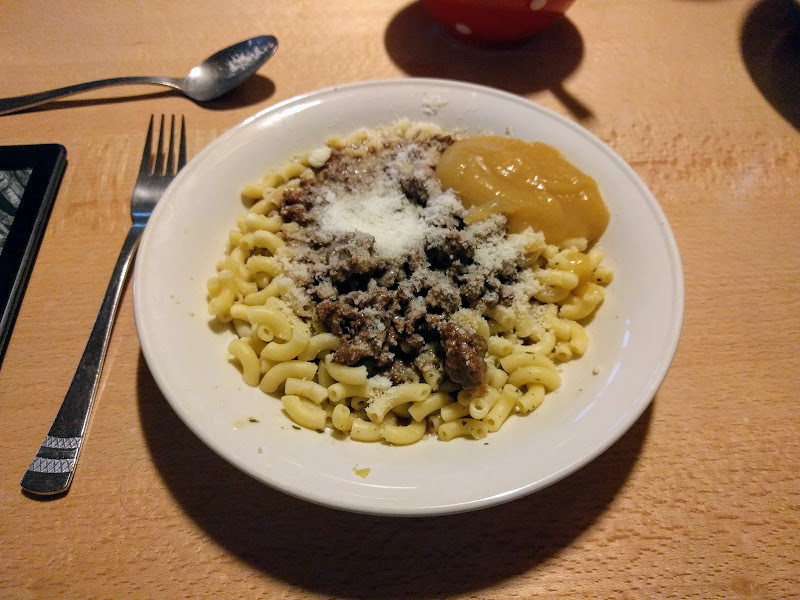 Traditional Swiss mountain food: pasta, beef stew, grated cheese... and apple sauce. 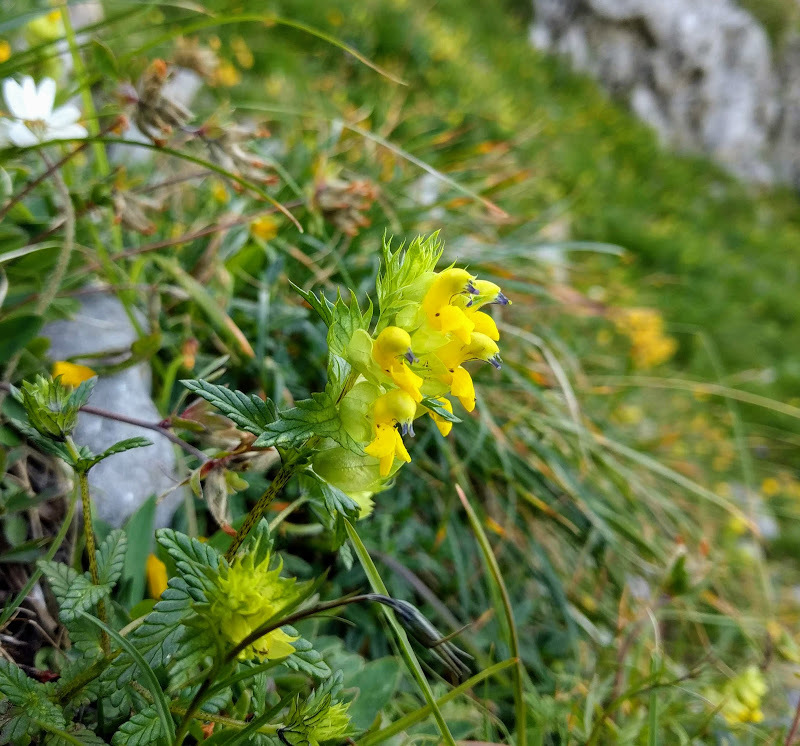 The next day was sunny, with alpine flowers everywhere. 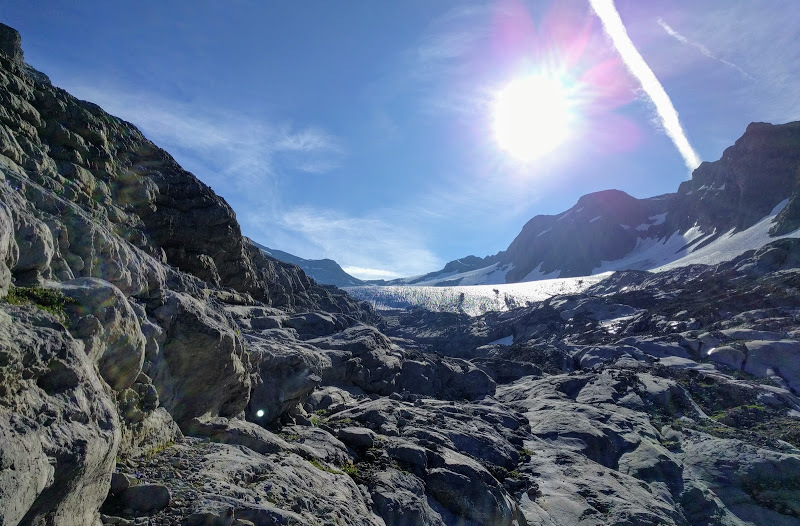 First sight of the glacier across the boulderfield. 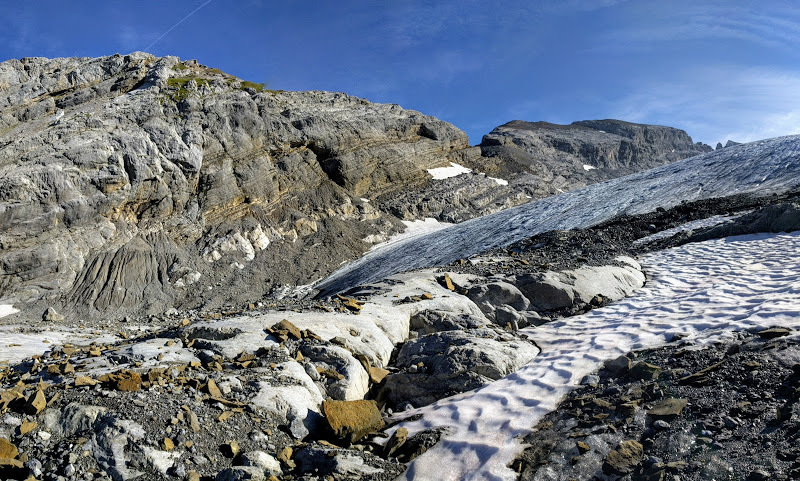 Further up, you can see where the glacier has scraped away the ground. It's less of an ice sheet and more of a frozen wave. 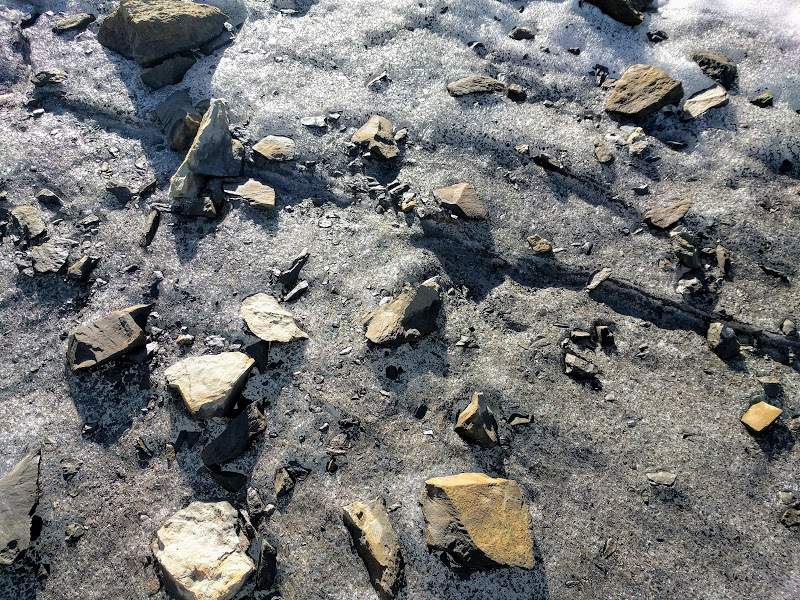 The glacier, in closeup. It's a lot darker than I was expecting. 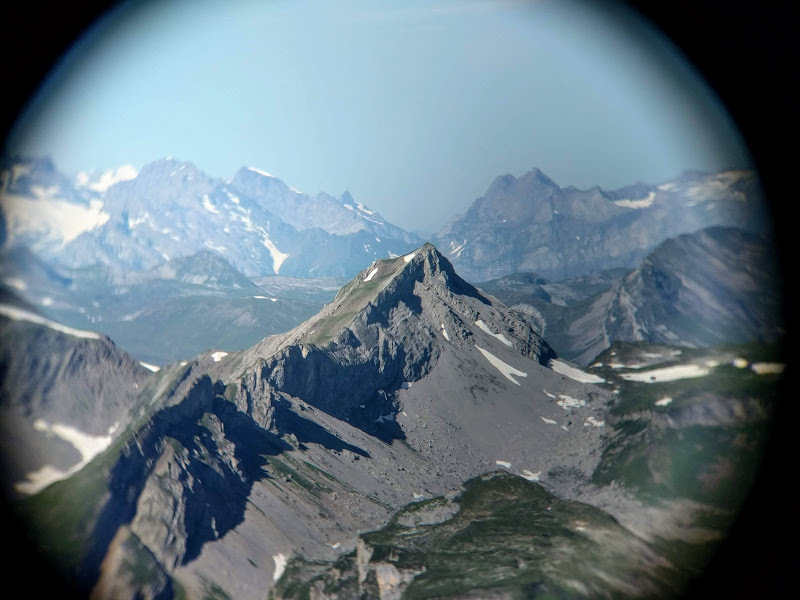 Through the telescope, the peak of Chratzerengrat (2349m). 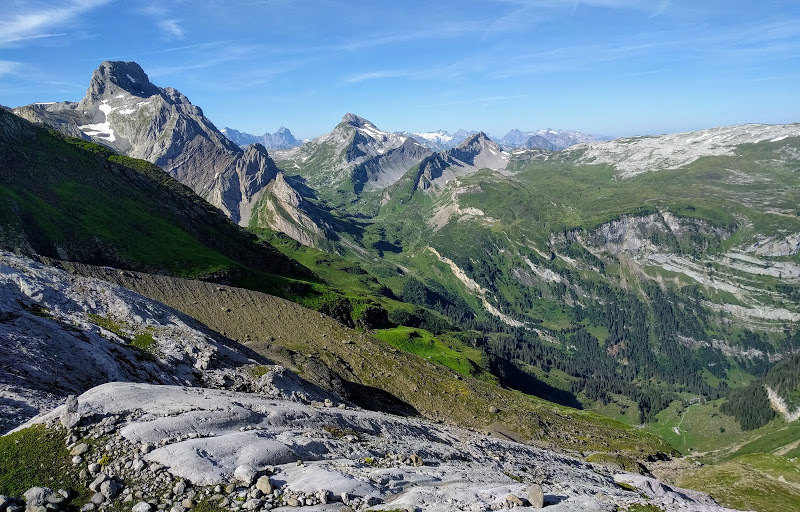 A wide-field view of the slope below Näbelchäppler (2445m); you can see the path down. On the other side of the valley is Silberenalp, where I walked back. 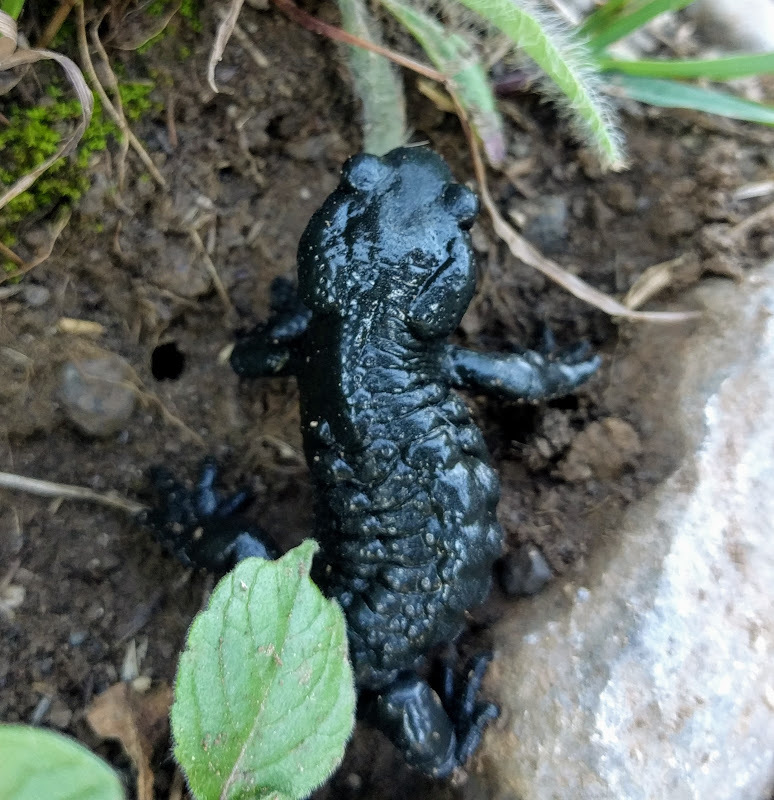 Mysterious wildlife along the way. To the south: the towering blade of Bös Fulen (2801m) guards the Zeinen pass (on the left) and the valley of Büchel (on the right). I've walked through both of them! The Rossmatter Tal valley floor, below, is a literal kilometre below me. From high up on Silberenalp, I look back where I came. 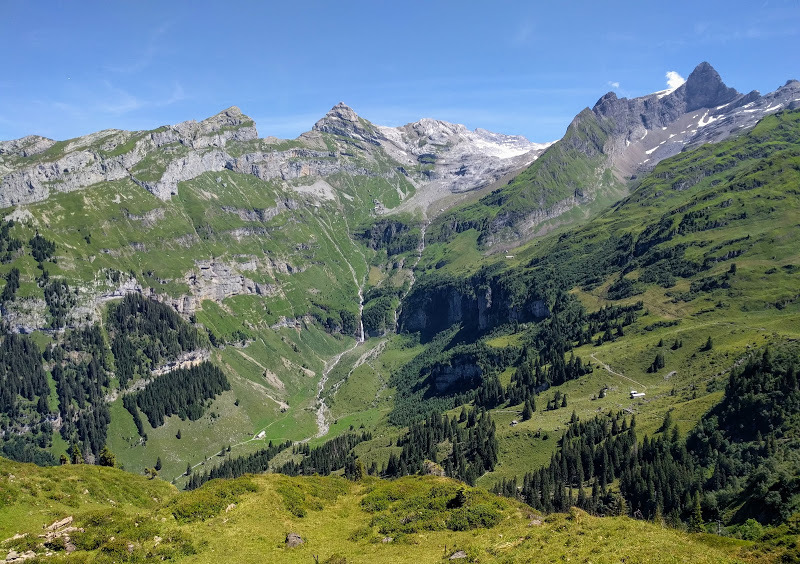 The road runs up Rossmattler Tal to the farm of Werben, on the valley floor below; you can follow the path zigzagging up the side of the mountain to Glärnischhütte, just above the cliffs in the upper centre; and from there the path ascends further to the glacier, upper right. The pyramidal peak is Näbelchäppler. High on Silberenalp, looking back. Klöntal and Klöntalarsee is on the left; Rossmatter Tal goes up the right. You can just see the edge of the glacier on the skyline. We're looking along one end of the Glärnisch mountain range; this is Milchplanggenstogg, rising into Näbelchäppler behind.